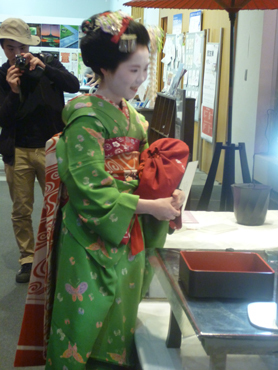 Today I visited "Kyoto Museum of Traditional Craft" in Kyoto. On every Sunday,we can see maiko's dance and crafts artizan's demonstration. so fortunately I could take a photo of her. Let us check her fashion. 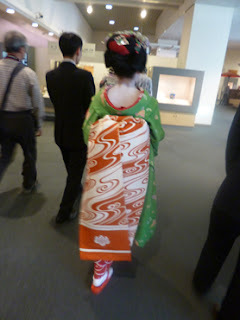 Today's her fashion is based around the color bright green and red. "Bright green" is considered to be the most suitable color in this May season. 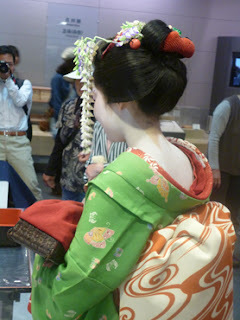 And please look at her kanzashi(ornamental hairpin),it is wisteria. In May,maiko wear this wisteria kanzashi. Because May is the season of blooming wisteria. 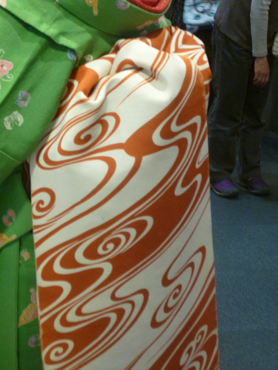 And this big obi is interesting. the color contrast of white and red is interesting. She seems enjoying walking around the museum. 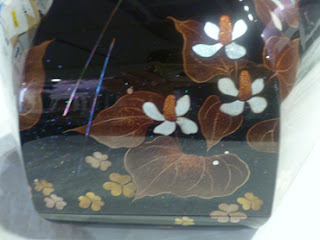 I found lacquer ware artizan. This lacquer ware box is made by him. He said that it took him 6 month to make this box. It costs around hundreds of thousands yen. Its wings are made of mother-of pearl,he said. And these flowers are Houttuynia (kind of herb),he said. 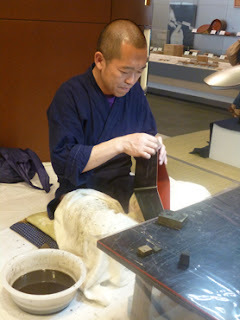 Gold powder is sprinkled,this technique is called "Makie". "Be realistic" is one of the characteristics of Japanese traditional design. Thank you for visiting my blog,I'm happy if you enjoy it. Hi, Kumiko! I knew about the museum but I had no time to visit. Now I see it would have been worth. 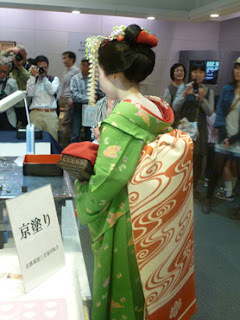 Good for you, you saw the maiko's performance, and how lucky to see her so near and even photograph her! A very nice post, Kumiko, I enjoyed it! 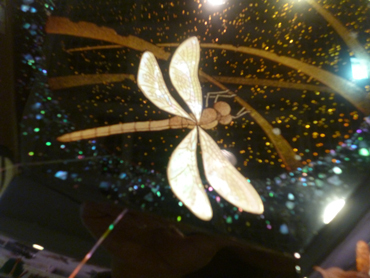 The laquer box is exquisite! I love it! 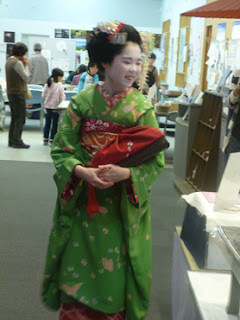 Indeed,it is difficult to choose where to go in Kyoto,because there are so many good sights! But your decision was right,I think. There were many exhibits in this museum,unfortunately camera is forbidden,only these photos were permitted. Me too,I love this laquer box! It is wonderful. 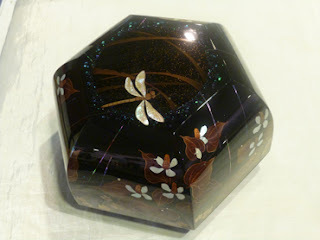 It's very interesting to see so many traditional arts together ( maiko, kimono, tsumame kanzashi, lacquerware... ) The lacquer box is fantastic ! Hundreds of thousands of yen ? For 6 months of work, it should be millions.. I hope he gets an apprentice : this kind of art should not be allowed to die out. Exactly,she is visiting the lacquer ware artist exhibit,after her dance demonstration finished. Yes,I think she is in her teens or twenties. Yes,this Museum is located near Heian-Jingu,and we can see this Maiko event on every Sunday. Pity taking photos are not permitted in this Museum,so I can't show you many other interesting exhibits.They were so nice. the artisans vary depending on the day. so I asked him about that. He said,"Million is too high. This price is under million." But it is worth million! Yes,I agree,I do hope these art and technique will be handed down to next generation. Now the number of successors are diminishing in Japan,it is serious problem.